The title of this column comes from Dr. Carla Hayden’s interview at the RUSA President’s Program at ALA Annual 2018. In the words of the Librarian of Congress, “Reference is, of course, facts. But it is also connecting people to what they need to know, when they need to know it.” Her statement was not just about reference, but about the core purpose of what we do in our libraries—all types of libraries—every day. Listening to the conversation between past ALA President Courtney Young and Dr. Hayden, I was inspired by the themes that cut across library types and connected with the mission of RUSQ. RUSQ is focused on the work that we do, rather than where we perform that work. Place and community are immensely important but our fundamental professional value lies in how we connect with those communities. RUSQ’s columns, research articles, and reviews focus on our shared goals and work so that we can grow professionally through reading a broad range of perspectives, ideas, and research. 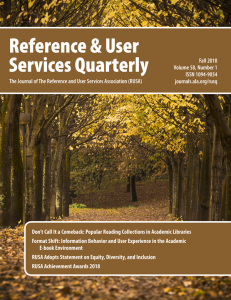 This quarter’s issue exemplifies this model, presenting content from public and academic librarians on topics ranging from reading to reference to career changes. View fall 2018 issue of RUSQ now.